Record Screen on Linux Desktop - If you looking for best screen recorder for Linux like Ubuntu, Linux Mint, Elementary and derivatives system, then Simple Screen Recorder is the first thing you can try to capture your Linux screen. Despite the name, this program actually has a lot of options. It can record programs, games the entire screen or part of it, or record OpenGL applications directly that developed by Maarten Baert. The recording can be paused and resumed at any time and many different file formats and codecs are supported. SimpleScreenRecorder is totally free and open source software which means you can redistribute nor modify the source code under the terms of the GNU General Public License as published by the Free Software Foundation, either version 3 of the License and it supports X11 and OpenGL. This screen recorder application for Linux has a Qt-based graphical user interface. I have used this code to create Linux tutorial videos. It's not only for Ubuntu and derivatives, SimpleScreenRecorder also work on any Linux distribution including Arch Linux, Gentoo, KaOS, OpenSUSE, Fedora, SLackware, Mageia, NixOS, and other Linux OSes. Added support for latest FFmpeg/libav. Make relaxed GLInject permissions actually work. The backend now supports fragmented recording, but there is no GUI for this yet. System tray icon now indicates errors during recording. The new release has been made into its official PPA. It's available for Ubuntu 12.04 LTS Precise Pangolin, 14.04 LTS Trusty Tahr, 15.04 Vivid Vervet, 15.10 Wily Werewolf, 16.04 Xenial Xerus and the latest Ubuntu 16.10 Yakkety Yak. Tired typing the same Linux command? You can simply create command line shortcut using bash aliases to save your time. That's it! You can now open the app via Unity dash or other Ubuntu's app launcher like Synapse Launcher. 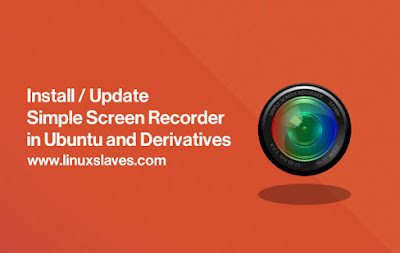 So that all I can write about a step-by-step tutorial how to install simplescreenrecorder as the best screen recorder app for Ubuntu Linux and derivatives system. Thanks for visiting us!